Darlington's Kaylee Meyers scored her 1,000th career point in the Redbirds' 62–47 win over Iowa–Grant Feb. 14. 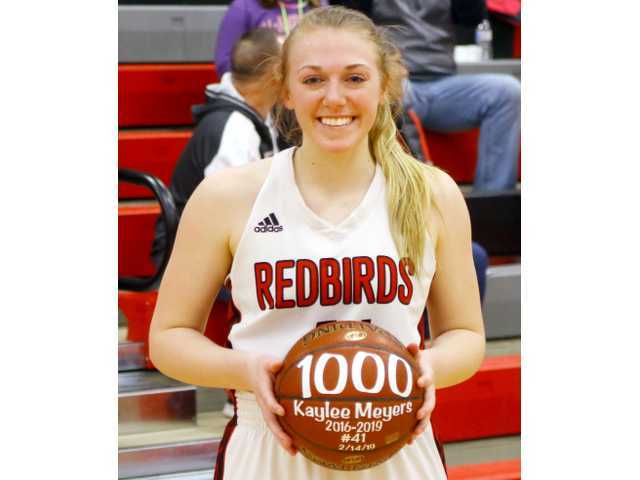 POSTED February 21, 2019 3:42 p.m.
DARLINGTON – Senior guard Kaylee Meyers sank five 3-pointers to shoot her way into Darlington’s 1,000-Point Club and lead the Lady Redbirds to a 62-47 SWAL victory over the Iowa-Grant Panthers at Darlington High School on Thursday, Feb. 14. “As I’m sure her family and friends are, I am proud of Kaylee for her accomplishment. She has put in the time and dedication the past three years to achieve this milestone in her high school basketball career,” said Darlington head coach Kelly Rose. Meyers hit three of her 3s in the first half to lift the Redbirds (17-4 overall, 11-2 SWAL) out to a 35-27 halftime lead. Seniors Bethany McDonald and Reagan Crist each knocked down two 3s of the own in the first half for the Redbirds, who used a 10-2 run midway through the first half to take the lead for good on the Panthers (7-15, 3-11). I-G got as close as one late in the half, but the ‘Birds stretch the lead back out to 35-27 by the intermission. An early 13-2 run in the second half put Darlington ahead 50-36 with 8:03 remaining in the game. With the game well in control, all that was left to do was to get Meyer to her milestone. She banked in her fourth trey with around five minutes to go to give the ‘Birds their largest lead of the night at 59-41, and then buried her fifth 3-ball with 3:03 to go to reach the 1,000-point mark on the dot. Meyers finished with a team-high 15 points. Fellow senior Kathleen Mathias chipped in with 12 points and junior Brenna McDonald netted eight, while Be. McDonald and Crist added eight apiece to aid the balanced attack. Sophomore Logan Hubbard scored a game-high 18 points for the Panthers. Juniors Olivia Liddicoat and Joanna Spurley tallied 14 points apiece for the guests. At Muscoda, on Friday, Feb. 15, Darlington finished off the regular season and locked down second-place in the SWAL final standings by holding off the upset-minded Riverdale Chieftains, 48-43. “I’m sure the girls would agree that it has been exhausting but a good test of their ability to handle adversity leading into playoffs,” said Coach Kelly Rose after her team picked up their fifth SWAL win in eight days to lock down second-place in the conference. Junior center Allison Thompson dropped in a career-high 14 points to lead Darlington over the Chieftains (9-11, 5-7). Mathias netted 10 points and Meyers scored seven for the ‘Birds, who will head into the post-season riding a five-game winning streak. Tess Johnson led Riverdale with a game-high 20 points. Mineral Point (19-3, 13-1) defeated Cuba City, 63-35, on Thursday, and then rolled over Fennimore, 69-35, on Friday to locked down the outright SWAL title for 2018-19. The Pointers won 13 straight conference games following a one-point loss to the Redbirds to begin the SWAL season to earn the crown. The Lady Redbirds received the #3-seed in their regional bracket and received a bye to open the WIAA Division 4 tournament. They will begin their tournament by hosting #6-seed Wisconsin Heights (6-13) in a regional semifinal game at DHS on Friday, Feb. 22, starting at 7 p.m.
Friday’s winner advances to the regional championship game against either #2-seed Mineral Point (19-3) or the winner of Tuesday’s quarterfinal game between #7 Luther (9-13) and #10 Brookwood (4-17) on Saturday, Feb. 23, also at 7 p.m.
Iowa-Grant – Liddicoat 14, Hubbard 18, Spurley 14, Runde 1. Totals – 18 11-20 47. Darlington – Brenna McDonald 9, Bethany McDonald 8, Allison Thompson 6, Kathleen Mathias 12, Reagan Crist 8, Maddie Crist 4, Kaylee Meyers 15. Totals – 24 5-9 62. 3-point goals– IG 0, D 9 (Be. McDonald 2, R. Crist 2, Meyers 5). Total fouls– IG 11, D 17. Fouled out– none. Darlington – Brenna McDonald 4, Bethany McDonald 4, Marissa Gould 2, Lizzie Schwartz 2, Allison Thompson 14, Kathleen Mathias 10, Maddie Crist 2, Aliyah Gould 3, Kaylee Meyers 7. Totals – 0 0-0 0. Riverdale – Couey 10, Te. Johnson 20, Mau 6, Hach 3, Ta. Johnson 4. Totals – 0 0-0 0. 3-point goals – D 2 (Mathias 1, A. Gould 1), R 5 (Couey 2, Te. Johnson 1, Mau 1, Hach 1). Total fouls – D 9, R 15. Fouled out – none.